As you may know, my Twin Cam motor in my chopper had a minor problem that did a lot of damage to the rest of the motor. I was going to be without a bike for a couple of weeks but needed to keep moving. 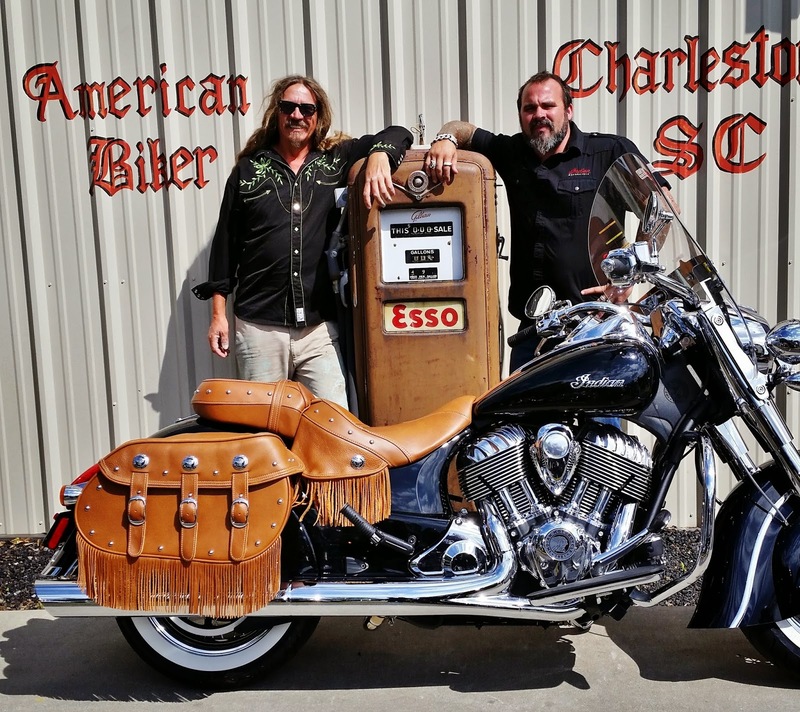 My friend at American Biker, which is an Indian, Victory and Polaris dealership in Charleston, South Carolina helped me out by lending me a brand new Indian to ride across a couple of states to my next destination. They had some other motorcycles but I have been chomping at the bit to try out the new Indians with the 111 inch Powerstroke motor. 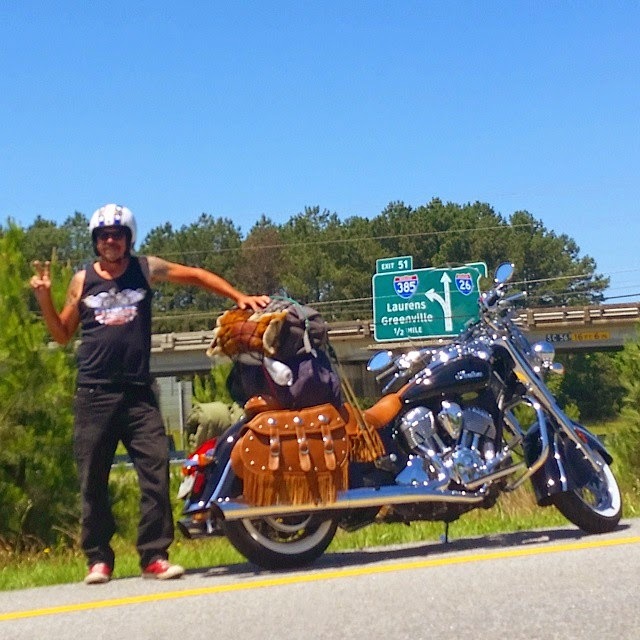 Some of you may remember this video I filmed with the motor when they debuted it at Daytona Bike Week 2013. Thanks to Rich, the owner of American Biker, I was going to test ride this for several hundred miles of Interstates then head across the Smokey Mountains of North Carolina for several hundred more miles. Rich gave me pick of his fleet and it was a hard decision. There was excellent highway bikers like the Chieftain and the Roadmaster but I opted for a more stripped down bike. The Classic comes with just a windshield so I got that with the Vintage package- Tan leather bags and seat. 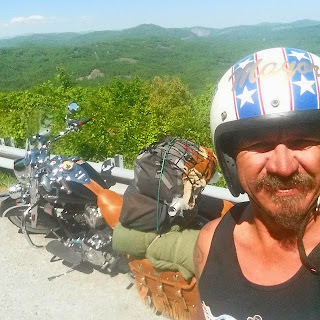 I strapped on my two duffle bags, tent and sleeping bags and filled the saddle bags with my trade mark top hat, rain gear, road atlas and other necessities and hit the road for the Smokey Mountain Chopper Fest. Rolling down the Interstate was effortless. The cruise control was almost necessary to keep me going the speed limit as it was easy to look down and see I was nearing triple digits. Yea, it really rides smooth and straight, even with all my heavy luggage piled up on the passenger seat. 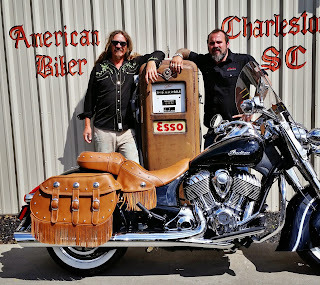 I expected this and the big Indian is a highway bike. Heavy bikes usually perform well on the highways. This bike never felt unstable or any sort of swaying at any speed. I did notice some vibration in the handle bar grips but I think I was just used to my aftermarket Avon grips. I think an addition of a pair of those would have taken care of that. 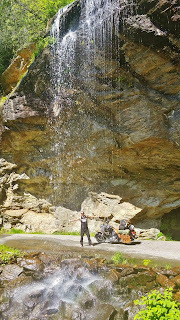 The next part of this trip was when I left the interstate and got on some back roads. These were the foothills of what would take me into the Smokey Mountains. The roads were filled with holiday traffic and riding through the small towns that were over run with traffic was a bit frustrating, but it wasn't because of the bike. It zig zaged through traffic and intersections like a much lighter bike. I could also come to a complete stop for seconds and then pull off without ever feeling the need to put my feet down. It really didn't act like a heavy bike at all. Soon I was in the twisty mountain roads and got to test out the ground clearance. I leaned that bike back and forth all day. I went through 15mph hairpin turns faster each time to see if I could get it to drag a little. Never once did I ever get a floor board or the kick stand to even scrape on the pavement once. Over the weekend I was even changing my side of the lane in a sharp turn just to simulate it was a sharper turn in search for the ground clearance limits but I never found them. I even rode a passenger thinking that would help find some turning limitations but it still rode like a sport bike. I didn't expect that and I am still very impressed. Everywhere I stopped on the bike, crowds were drawn. I was always fielding questions being told that it was a beautiful bike. I'm used to people commenting similar things about my custom chopper but I have months of labor and over double the amount of money in building my bike. Here this bone stock bike was doing the same thing. When I got to Chopper Fest with several hundred custom bikes, I missed my chopper but didn't feel too out of place. I even had several friends practically beg me to take it for a test ride them selves. I let some of them and they all agreed when they returned that it was a surprisingly easy and fun bike to ride. I have heard some people complain about "valve pinging" and I did notice that at low rpms, it does ping. 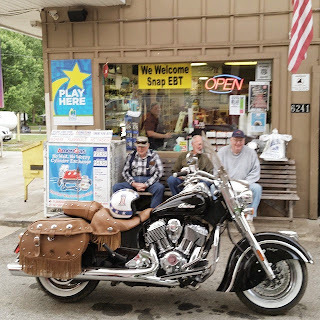 Most all stock bikes do since strict EPA regulations do that but I also found that with a stock Indian, they perform much better by learning the power curve and revving the rpms a little higher than other bikes. I also found out that revving them real high is where a whole lot of horse power is waiting. All in all, I loved the bike. I was thinking about maybe buying one before but now, I'm talking to financier and looking at all my options and have a feeling that I may own one in addition to my chopper. Life is too short no to enjoy all the good things in life! I enjoyed your review Kevin, I'm a big Harley fan I own 2 an "05" Road Glide and a "94" Dina Wide Glide and love the ride on both but when I took the new Indian out it will be my next new bike.